You’ve just made a sale in you e-commerce store. But 27 days down the road you are faced with a chargeback request from your merchant account provider. You’ve not only lost the sale, you might also have lost your goods, and you’ll probably also face a chargeback fee. In this post I’ll give you an idea on how to avoid this happening to you. After a customer has made a purchase‚ his credit card statement will have your “credit card statement name” written on it. Most often this is just your legal business name, like “Apple Inc”. Because a new statement appears for each and every transaction your customer makes, he quickly ends up with a list of hundreds of cryptic business names, making it very difficult to remember what the transaction towards your business name actually represents. But sometimes your customer will only remember the product he bought from you, not your business name. This will inevitably lead to chargebacks on otherwise legit sales, simply because your customer can’t make the connection between your business name on his credit card statement and the product he received. Luckily there’s a way to avoid this. 37signals, a company selling online software on a subscription basis, have found a great way to lower their chargeback rate. If you’re a 37signals customer, you won’t see “37signals LLC” on your credit card statement. Instead it will say: “37signals-charge.com”. 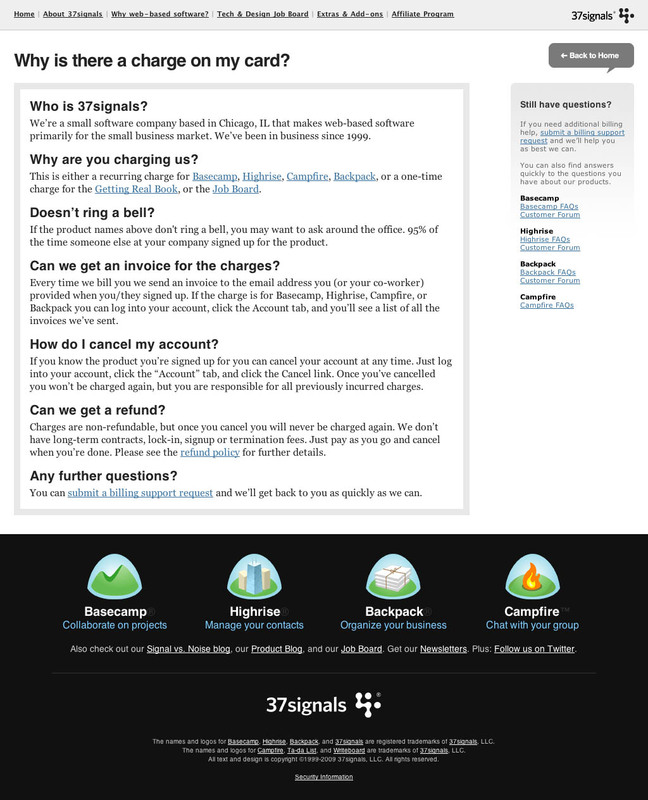 37signals offers a simple FAQ answering relevant customer questions like: “Who are you?”, “Why are you charging me?”, “How do I cancel?”, and “How do I contact you?”. Imagine you see a charge on your credit card statement that you can’t recognize - isn’t this exactly the kind of questions you’d want answered? Buy an appropropriate domain name for the page. 37signals used their business name followed by “-charge.com” which seems like a relevant domain for this (also, it is very likely to be available). Contact your bank (or whoever is responsible for your merchant account) and ask them to change your business’ “credit card statement name” to the new domain name. Make a dead simple page where you answer basic questions like: “Who are you?”, “Why are you charging me?”, “How do I cancel?”, and “How do I contact you?”. It’s important to write these as answers to someone who has trouble remembering who you are and what you might have sold him. This will cost you an afternoon of work and $10 for the domain name. Quite cheap if you can avoid just a few chargeback cases. What do you think about this way of lowering you chargeback rate? Let me know by posting a comment. Authored by Christian Holst. Published on November 13, 2009. @Per, great let me how it works out for you. Ties back to your point that sometimes customers request charge-back because they don’t recognize the vendor. Spot on! Thanks for the link, it’s an interesting read.. It is important to understand that chargebacks occur before the related dispute is resolved and still count even if the final decision is in the merchant’s favor. So even if the charged back transaction turns out to be valid after all, the merchant still has to pay the chargeback fee and the transaction still counts against their chargeback limit. Thanks for your explanation of the chargeback system. The purpose of the method presented in the article is however to prevent the customer from filing a chargeback in the first case.